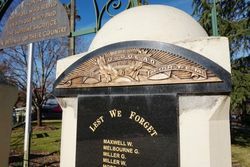 The Soldiers Memorial forms the gates to the Yackandandah Gardens, and was constructed after World War One. The wrought iron fence was forged locally in Meurant's Foundry, and the fence pillars list 216 names of those who served in World War One. The memorial gardens were opened by Mrs W. Ramsay on the 9th June 1924 and the memorial tablets containing the honour roll of the men of the district was unveiled Mr H. Beardmore M.L.A. after a prayer of commemoration to the fallen soldiers and the playing of "The Last Post". Wodonga and Towong Sentinel, 13th June 1924.